There are lots of ways to create an elementary informance. They depend on your school, class size, and the typical music activities you do in class. In this post I’ll outline my personal process, but the sky is the limit on how simple or complex you make your informance! Psssst….. One the go? Listen to this post instead of reading! An informance is any production that is for the purpose of educating an audience about a topic. It can be as simple as inviting parents to watch your music class and giving them a brief explanation of the activities the students are doing. It could also be more formal and take place on a stage. The key is that education is the backbone of the presentation. When I do an informance, I want to educate my colleagues, parents, and community about the amazing creative musical work my students do in a typical music class. In contrast, a performance is typically meant to be a final product. Both performances and informances give valuable insight into the learning process. I do a blend of both at my school and I feel that it shows the balance of artistry in the music room. An informance not only highlights your students and the amazing work they do. It also highlights your program as a whole. Music teachers by nature are a bright, intentional educators who teach their students how to learn through music. And that alone is amazing. When you add your personal creativity and love for your individual students, the program turns into something wonderful and something worth sharing. However, unless your school district has someone hired to represent your program and do that sharing for you, it’s likely that you are your program’s biggest advocate. It’s also likely that you are the only person who knows the complexities of your curriculum and thought process behind each activity. If that’s the case - and it probably is - we should consider taking on more of an advertisement and educational role in our community as well as our classrooms. Companies do this all the time. They recognize that people have to see a need for their products before they’re willing to invest in them. To make people recognize a need, they talk to their audience about the benefits of their product and show how it works. They promote their brand through advertisement and information. Music teachers would be wise to do the same. While it can be uncomfortable to compare our music classrooms to a company selling products, it’s worth taking a cue from the information and advertisement model. We want parent, administrative, and community investment in our programs through the form of attendance, participation, and financial support. But if all these parties see is the final product, they’re missing the majority of the magic that takes place in your classroom, and the majority of the reason they should invest in what we do. When it comes time to plan your informance activities, think about what you are doing in your classroom that is artistic and student-driven. Ideally, a large number of your classroom activities fit in this category. If that’s the case, it should be simple to take that same activity (a game, movement, a folk song) and put it on a stage. My informances include folk dances, speech pieces, songs, and instrumental pieces. They show students singing, speaking, moving, improvising, playing instruments. In other words, I include our day-to-day classroom activities. There are times when a classroom activity may not be appropriate for a staged production. For example, I imagine my audience would not be on the edge of their seats to watch students do a dictation activity. Those skills should still be highlighted, but those dictations may be better displayed on a slide show before the program with a bit of text explaining what dictation is, and how students completed the activity. I find it the most helpful to base my informance on a book. This gives me a structure for the program, while keeping it playful. I use children’s literature in my classes frequently, so the production still seems natural to my students and me. I like to take a trip to Barns and Noble children’s section and sit on the floor with a notebook and a pile of children’s literature. You could also do this at your local library or your school library. In this post I talk about choosing classroom repertoire, and 4 criteria songs need to meet in order to make it to my students. Is the book high quality? Children’s books certainly will be on the simple side in terms of grammar and structure, and likely they will be fun to read. But do they also speak to where children are developmentally? In addition to the text being simple or playful, is it also thoughtful? Could the book be enjoyed by both children and adults? Do I like this book? Will I go NUTS reading the book over and over as I prepare for the informance? Is there a Curricular Tie-In? Remember that informance preparation is not separate from your normal class. The typical class activities are the informance. If I were not preparing for an informance, would I use this book in my classroom? Where are the musical connecting points in this book? How can it showcase what I’m already doing? Do I feel creatively drawn to this book? Would my students feel creatively drawn to this book? You could also consider basing your informance off of a poem or school motto. In the past I’ve based an informance off of the lyrics to a song, and it was a smashing success! There’s flexibility to do what suits your program the most naturally. What we do in our classes differs significantly from what students do in other classes such as math or science. While parents likely have a realistic picture of what those classes look like, they may not understand how a typical music class operates. While an informance is a great way to bring them into the process, it can be helpful for parents to have a bit more context about your music room. To help with the informance presentation, I like to document my classes about a month or two leading up to the production. I take videos of students improvising, playing a game, or singing a song. I collect written compositions. I ask students to share what they’re learning in class. From there I can choose how to display the student work to create a bigger picture of the media and processes we use in the classroom. I use the Seesaw app for this. Seesaw is a free, easy to use software that lets me upload student work to share with parents. After I invite parents to join the class they can like and comment on student work. I can also use this platform to post announcements, such as the date and time of the informance. I’ve had a lot of success with this parent communication tool, and I think it’s one reason my audience turnout is so high at the event. Here is the teacher dashboard of a sample class. (I’ve blocked out parent and student names.) In this activity students used rhythmic building blocks to compose a B section for the song, Kookaburra. At the time we hadn’t yet learned the real name for takadimi, so the 16th notes are notated as four dots on one card. We performed their final rhythmic patterns at the informance, and it was helpful for parents to see the composition progress from week to week. 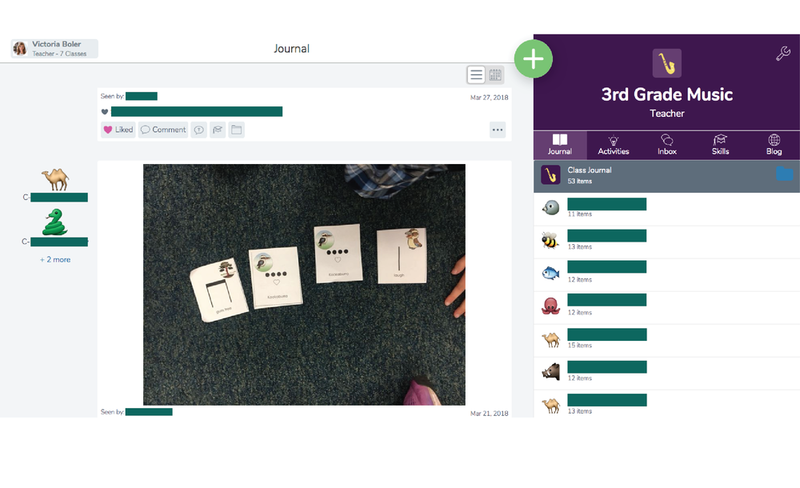 If every student at your school has an ipad, you can find a way to incorporate Seesaw into your classroom. However, I found that most of the time it was easier to simply film the students myself and upload to their student profile. This made made more sense especially if we were doing a whole-class game or activity such as Bluebird Bluebird. If students were working in small groups to compose an ostinato it made sense for them to bring a few class ipads and take a picture of the work themselves. In the next post I’ll talk about the details of putting an informance together, from rehearsals, to parent invitations, to song selections. In the meantime, if you have a question about the informance process drop a comment down below, or reach out to me on instagram.